You may have noticed some behavior changes in your senior cat. Some of these changes can be symptoms of pain (here’s my article on how to tell if your cat is in pain), but we need to consider dementia in addition. Yes, cats, like people, can become senile as they age – happens to many species! The term “dementia” often brings to mind Alzheimer’s disease in people, and rightly so. Cats can develop memory loss and personality changes similar to Alzheimers. Research is ongoing in this field (the medical term is “cognitive dysfunction”), as there is still a lot for us to learn about the causes and potential treatments. The most important thing to know is that the diagnosis of feline dementia requires the owner’s observations! There is not a blood test, x-ray, or brain-scanning MRI that diagnoses this syndrome. We reach the conclusion based on symptoms, and ruling out other diseases as a cause. The complicated part – cats can have cognitive dysfunction in addition to other diseases, so the diagnosis can be tricky. Symptoms can be subtle, so it’s important to observe your senior cat carefully. The biggest sign is disorientation, or seeming lost. The cat may walk into a room, then leave promptly to go somewhere else. He may lay in odd places (can also be a sign of pain). Related to this is wandering or pacing. Some animals even have a route they trace throughout the house over and over and over. Vocalization can be a symptom as well. The more common reason for increased “talking” in older cats is an overactive thyroid gland, called hyperthyroidism. Yet, I have many owners who get that disease diagnosed and treated, and the cat is still very vocal. Sometimes, hearing wanes with age, making the volume of the vocalizations louder to us (sounds the same to the cat though!). Sleep/wake cycle disturbances are a tough symptom to pinpoint in cats. They are by nature on the nocturnal end of the spectrum. Yet, if you notice your cat’s schedule changing (sleeping more in the day, or not able to get comfortable at night) these are worth mentioning to your veterinarian as well. Another vague sign is urine or feces accidents outside the litter box. Many factors can contribute to this besides dementia. Arthritis or other pain, coupled with a tall or out-of-the-way litter box can make a cat decide to just go on the floor! (I do not recommend having all litter boxes in the basement for this reason.) Many senior cats can develop arthritis and dementia, so a litter box that takes some work to get to will be less likely to be used. Here’s the tough part. The way we diagnose this disorder is to evaluate the symptoms and rule out other causes. 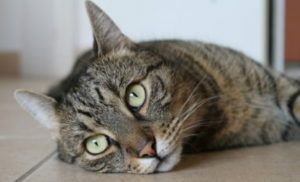 In older cats, kidney disease (renal failure) is very common. This causes them to drink a lot of water, and subsequently have to urinate more. Some of these cats have accidents outside the litter box. They could have dementia, or they could have to urinate a lot, and the litter box is in a hard to reach place! A routine senior blood panel is a great way to start eliminating (or diagnosing) diseases in your cat. This will check for kidney disease, diabetes, liver disease, and thyroid levels. A urinalysis completes this “baseline” panel, and measuring blood pressure is always a good idea as well. A thorough assessment of your cat’s neurologic status as part of a physical exam can help us determine if more is going on than just age-related brain changes. Once we have either ruled out other diseases, or found them and are managing them, we can reach the conclusion the cat is (perhaps also) suffering from cognitive dysfunction. Unfortunately, there are less options for cats with this disease than there are for dogs. In my experience, I diagnose and find myself discussing this disease more with dog owners than cat owners. Dogs are more forthcoming with their symptoms (hard to miss a dog who paces, pants loudly, and never ever lays down) while cats can be more subtle. Further, the goal of treatment is not to cure the disease -that is not possible – but to relieve symptoms so the quality of life for everyone in the house is better. There is a prescription medication labeled for dogs, called Anipryl, that has been used in cats with varying degrees of success. I’ve used it in more dogs, and some owners say it is a wonder drug, while other are less impressed. My personal favorite treatment is in the form of Omega 3 fatty acids, such as fish oil. Medium chain triglycerides (found in coconut oil) may be helpful in treating brain dysfunction as well – the research is still early. Senilife is a non-prescription supplement available in a feline version that contains a combination of ingredients that are supposed to help the brain function. I have only tried it on a couple feline patients, and while it did not hurt anything, the owners weren’t sure how much it helped. Besides medications and supplements, making the home an easier place to live can be a huge help! Keep food and water bowls easy to reach. Have the litter boxes on the main floor of the house the cat prefers. I have some owners who buy steps so the cat can lay in her favorite window, or get up on the bed! Mental stimulation can help as well! Play that is not overly physically taxing can keep your cat’s mind sharp! Puzzles with a treat reward are always fun, or simply hiding some treats around the house so your cat can “hunt” can be stimulating. Most of all, be understanding. Accidents outside the litter box are just that – accidents. Laying in what may be an inconvenient place is not him “getting back at you” – his brain thought it seemed like a good idea at the time. Show love, and accommodate your senior cat’s needs. He was a great cat for a lot of years – time to return the favor! Posted in Feline specific, General health, Senior pets.